Location.--Latitude 47°48'25", Longitude 124°14'59", in NE 1/4 NE 1/4 Section 33, Township 27 North, Range 12 West, in Jefferson County, Hydrologic Unit 17100001, on left bank 250 feet downstream from U.S. Highway 101, 1.0 mile downstream from Hell Roaring Creek, 11.5 miles southeast of Forks, and at river mile 15.4. Drainage area is 253 mi2. 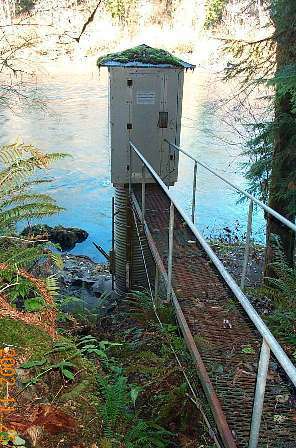 Datum of gage is 163.64 feet above NGVD of 1929. Additional Data and Information.--Station data inventory, annual data report. flood frequency, and latest shifted rating.